I am a resident of village-manik chauk, dist-sitamarhi, state-bihar. 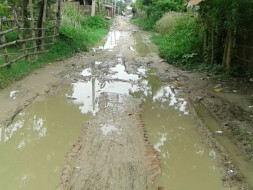 The condition of roads in my village is in pathetic condition. I have contacted almost all the government officials but they are not willing to help. The road is 2 km long. It is the only lifeline for all the remote villages located there. We have contacted a contractor. Pitching or building a concrete road will cost more than 20 lakh. Hence we have decided to remove the bricks. Then we will level it. After that we will finally make the road with bricks. Removing bricks will cost approximately 50000 INR. Leveling with soil will cost approximately 2 lakh INR. Rebuilding will cost approximately 5 lakh INR. We will manage 2.5 lakh INR ourselves. Hence I request you all to contribute so that we can build our road ourselves.